Taking a similar angle to NetEnt’s fantastic poker-themed slot, Kings of Chicago, or iSoftBet’s card game themed, Poker Mania, Castaway takes the popular Texas Hold’em format and applies it to an online slot. Slot developer NetEnt’s game has a rather unique feature – all the game’s symbols are playing cards, and you simply have to make winning poker hands to win cash, with – appropriately – the Royal Flush bagging the top jackpot payout. That slot is just one example of how poker can be successfully transferred into an online slot and make a slot title appeal to poker fans as well as slots fans. This slot is another example. Once again we see the poker element introduced and I have to say that this Leander Games slot has adopted it very effectively. 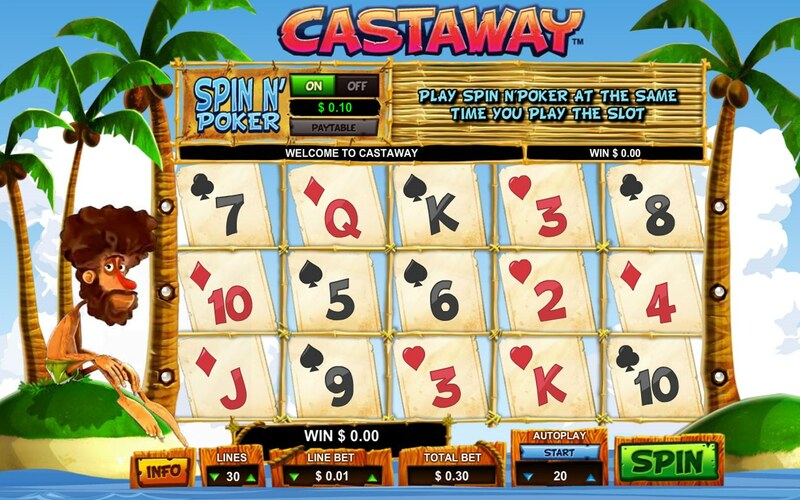 Leander Games’ Castaway, a 5 reel, 30 pay-line slot set on the desert island, but featuring symbols all related to playing cards, has something similar – the ‘Spin N’ Poker’ feature which activates a side game. Spin N' Poker can be turned on any time during play to increase your bets during the spins. When you spin the reels, two cards will be dealt at the top of the screen. After the reels stop, the three cards that appear down reel 5 will be added to your two to make a 5-card poker hand. Depending on what hand is formed, you will get paid out accordingly, with a Royal Flush paying out 5,000x your line bet. It’s a great feature for poker fans and a nice touch to get you more excited about regular reel symbols. There’s a downside, however – Spin N’ Poker will cost you 10x the line bet to activate, making this one for the big bettors only. Not only that, the feature can only be activated when playing the maximum number of lines. The Wild Castaway symbol substitutes for all symbols other than the Bonus and Scatter symbols. The Scattered Ace Bonus triggers either free spins or the Infinite Hold’em bonus game when you hit three or more on the reels. For free spins, anything from 10 to 30 freebies can be had depending on how many Scatter symbols you hit on the reels. During the round, you can get an additional 10 to 30 spins if you hit more Bonus symbols. Not only that, but after each spin, extra Wilds will fall onto reels 2, 3 and 4 randomly. The second bonus game is a Hold’em match-up game, another great feature for the poker fans among you. Depending on how many Scatters you hit in the lead-up to the round, you will be dealt a number of two-card poker hands respectively. If your hand improves to two-pair or better, it will advance to the next round. Your bad hands drop out and you will keep progressing to see which of your hands make it to the last level, where you’ll then get a juicy payout. 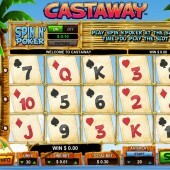 Overall, for poker nuts, Castaway really delivers, and it’s another great offering from Leander Games. You’ll have to bet a bit bigger to take advantage of the extra features, but do that and you can really make them pay.